If you had the presence of mind to invest in a pull-along wagon for your kid you must be congratulating yourself for the decision. 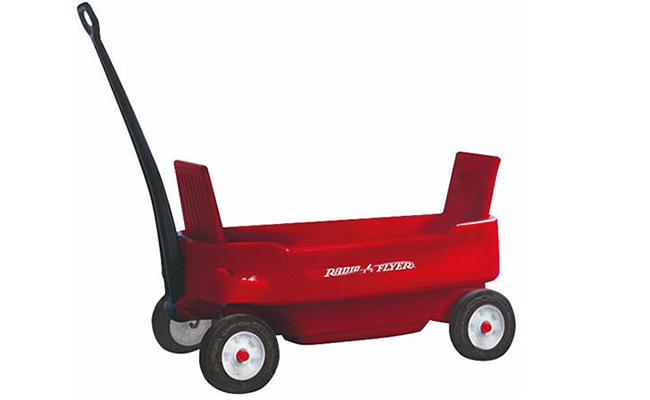 If not, then maybe you should consider getting one for your children because these versatile wagons can be more useful than you can imagine. Buying the right one, however, requires quite a bit of research on your part because the market is flooded with cheap wagons which sometimes people buy thinking there cannot possibly be much difference between one type of kids wagon or another. To give you a better idea of what to look for when shopping for one, we put together a list of the ten best pull-along wagons for kids money can buy. 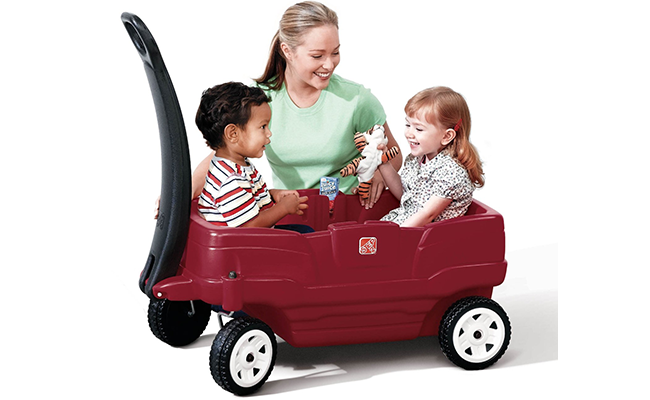 Equipped with a spacious storage compartment, this wagon can store quite a lot of snacks and toys if or when necessary. It also benefits greatly from its foldable design that enables you to store it with ease after folding it, a feature that also facilitates its transport. 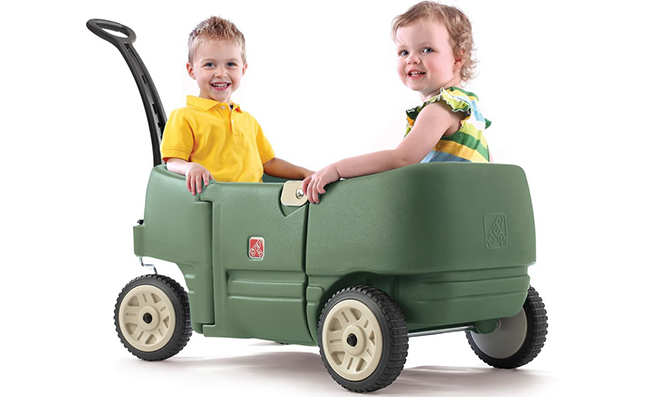 Speaking of design, this wagon is made from heavy-duty plastic, a construction that makes it very tough and durable. This multi-function wagon from Step2 can be used for almost anything by your kids, a versatility it owes to its large storage capacity. 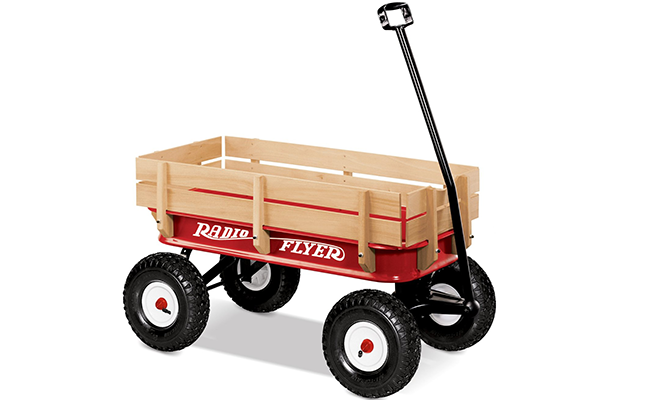 One thing to notice about this particular wagon is that it features a pretty sturdy construction overall but especially the wheels which are very durable yet very quiet by design. Furthermore, the wagon has an easy-pull handle design which is definitely something to look for when shopping for one. 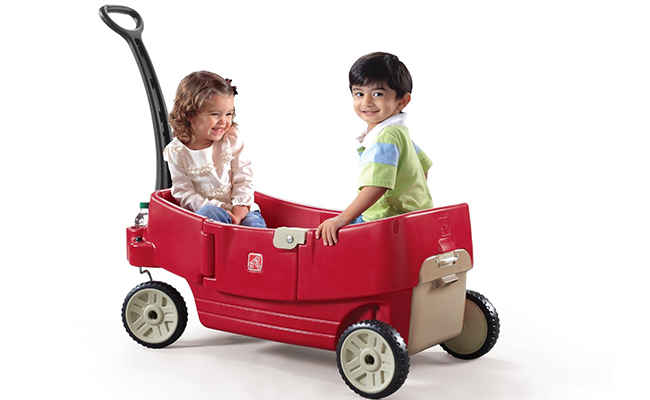 The first thing you notice about this wagon is that it features an easy latch door designed to facilitate easy access. Although not entirely necessary, it is still a nice feature to have, especially given the fact that most wagons are lack doors of any kind. At the same time, the wagon comes with two seat belts and an under-seat storage compartment for good measure. Last but not least, it has a very long handle that makes the wagon easier to pull around. 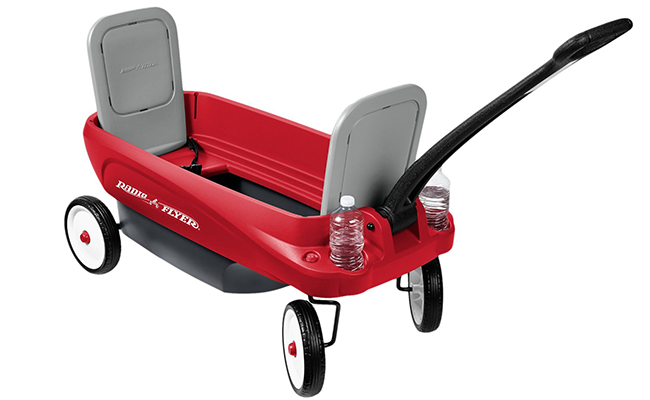 Thanks to a sturdy plastic body, easy steering, and a reliable front axel with no-tip turning, the 2700 Pathfinder Wagon from Radio Flyer is perhaps one of the best pull-along wagons on the market today. It not only comes with features most wagons don’t possess but it also comes with an exclusive convertible feature with a 2 wagons-in-1 system and seats that can fold up or down for greater comfort. Like the name suggests, this is an off-road wagon if we can call it that, mainly due to its capacity to handle almost any environment. 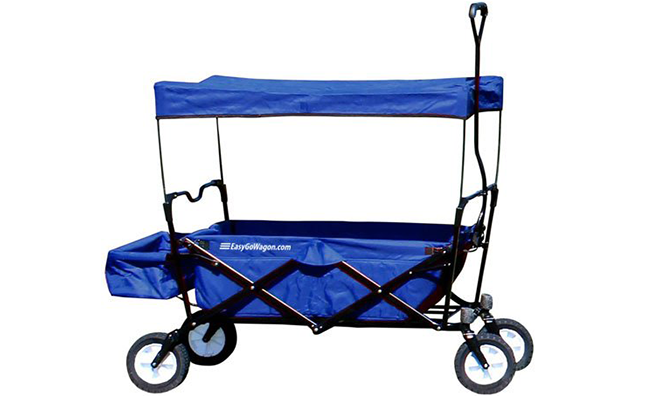 Due to its collapsible design and large wheels, you will definitely be tempted to take the wagon with you to the beach or when you’re camping, conditions it will handle perfectly. 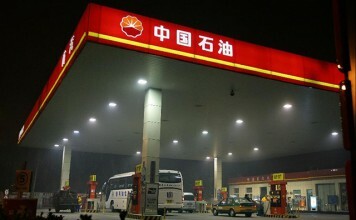 In truth, it is perhaps one of the few pull-along wagons that actually fits inside a car without taking too much space. Despite its size, this particular wagon is almost as spacious as two wagons, which recommends it for any family with more than one child. The two seats it comes equipped with are suited with seatbelts for added safety, a feature that doesn’t interfere with the wagon’s overall capacity. Also worth mentioning is the fact that it comes with 4 cup holders for easy access to drinks and snacks, as well as an extra under-seat storage. This pull-along wagon stands out not only thanks to how quiet it is but also through its ingenious design. It also comes with an attached cooler that can be filled with ice to keep drinks and snacks cold at all times. Not only that, but it also comes with seatbelts and drink holders along with removable sides that enable you to cart around supplies if needed. 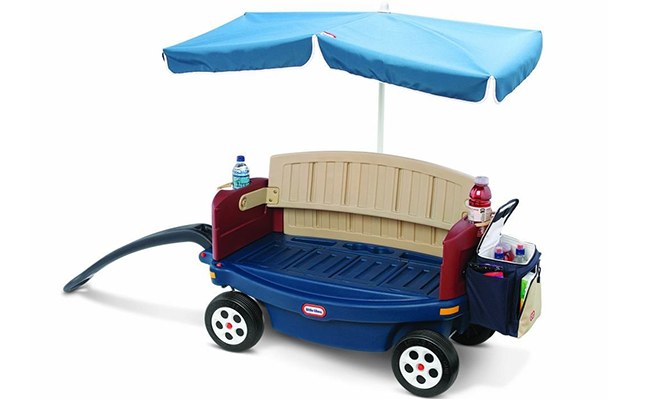 On top of all this, the wagon comes with an umbrella to protect the kids from the sun. 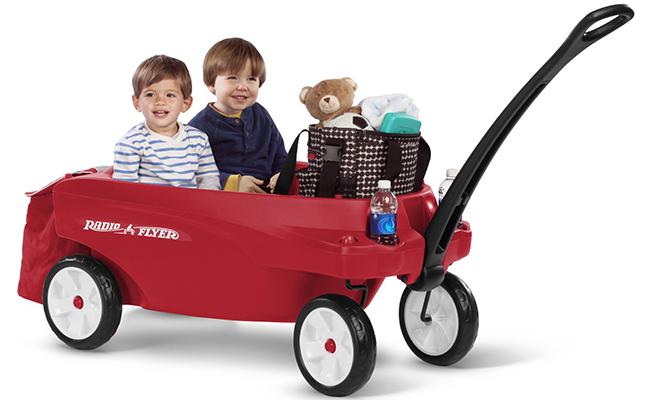 Radio Flyer’s Triple Play Wagon returns to the roots per se, because it resembles standard pull-along wagons more than any other wagon on our list so far. Designed to comfortably fit 1, 2, or 3 riders, this spacious wagon will surprise you with how many things you can use it for. We should also point out that it features 3 seatbelts for safety, 6 cup holders, extra-large storage bag that folds away with ease, and a foldable handle to facilitate easy storage. This is perhaps the most portable pull-along wagon on the market, seeing how it can fold to 1/8th of its original size. It also comes with heavy duty wheels and tires designed to handle almost any surface with ease. 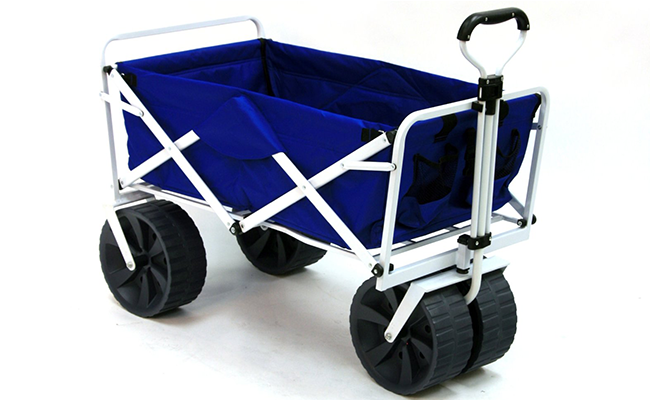 Furthermore, this particular wagon comes with a fabric that can be used to cover it when not in use, a fabric that goes very well with the wagon’s foldable nature, thus increasing its maneuverability. When you heard talk of pull-along wagons you most certainly think of wagons shaped like this. Not only is this wagon designed in a traditionalist fashion but it also expands on the features any good wagon should possess. Among them, a handle that folds under the wagon for easy storage, rubber tires that can be filled with air to make riding it smoother, a reliable, heavy-duty frame with a weight capacity of 200 lbs, and much more. Overall, it comes as no wonder that this particular wagon won the National Parenting Publications Award and Early Childhood News Director’s Choice Award.